WASHINGTON — The Army in recent years has asked for billions of extra dollars in funding to grow its force and increase its capability beyond what its normal budget requests contain, but this year the service is only asking for $308 million in its unfunded requirements list sent to Congress earlier this month. The unfunded requirements list is a wish list typically sent to Congress by each service to help guide Capitol Hill in considering what additional funding beyond the budget request Congress might provide as lawmakers begin to draft the policy and spending bills. At the beginning of the Trump administration, the Army diverted from normal practice and submitted a wish list to Congress in January 2017 asking for more funding beyond the fiscal 2017 and FY18 budget requests to increase its end-strength by 16,000 more soldiers. And it calculated it would need an additional $8.2 billion not included in 2017 and an additional $18.3 billion on top of its yet-to-be-released 2018 budget request. And when that FY18 budget request dropped in May, the Army submitted another unfunded requirements list to Congress asking for an additional $12.7 billion in funding to grow the force by another 17,000 troops, increase munitions stockpiles and modernize brigade combat teams and vertical lift capabilities. This year it was believed by several sources familiar with the process that the Army didn’t even want to submit a list to Congress, but instead chose to submit a meager one. The requirements list — obtained by Defense News — would “provide opportunities to accelerate the Army’s readiness and lethality to meet combatant commanders and the National Defense Strategy requirements,” according to the letter accompanying the list sent to Senate Appropriations Defense Subcommittee Chairman Thad Cochran, R- Miss., by Army Chief of Staff Gen. Mark Milley. The reason for the modest list is likely due to the fact the Army’s FY19 budget request marks an out-of-the-ordinary and enabling increase over previous years. The service requested $182 billion — an 8 percent, or $13 billion, increase over the yet-to-be-passed FY18 budget of $169 billion. Previous budget requests regularly prioritized meeting Army force readiness requirements over modernization, but the new budget request has allowed the Army to be able to meet readiness while taking strong steps forward to modernize. The RCO was established in August 2016 and was designed to zero in on the Army’s biggest requirements with the intent to deliver capabilities within a one-to-five year horizon. It immediately honed in on developing capability in three areas: Electronic Warfare; Position, Navigation and Timing and cyber, areas neglected in counterinsurgency operations over the past 15 years of war in the Middle East. The RCO has moved out quickly on many projects including a more recent one — as Defense News first reported in October — to address underground facilities along the North and South Korean border using EW and PNT capabilities. The unfunded requirements list asks for $239.2 million to support the NDS to include $153 million in cyber electromagnetic activities for the RCO as well as $25.4 million for a intelligence, surveillance and reconnaissance quick reaction capability. “The requirements include critical cyber electromagnetic activities and several RCO efforts that will provide greater cyber capability,” according to the list. The Army is also asking for $13.2 million to fund special information operations, $14 million for the Guardrail Common Sensor and $33.6 million to support the Korea Yongsan relocation plan and land partnership program. The funding would provide an open architecture for signal intelligence pods for the Gray Eagle unmanned aircraft system and upgrades to Guardrail sensor’s geolocation communication sensors. The Korean activities are directly related to supporting the Army’s command, control, communications, computers and intelligence (C4I) infrastructure requirements at the U.S. Army Garrison Humphreys in South Korea. The Army asked for $69 million to support increased lethality “and deter aggression in the Pacific, Europe and the Middle East,” according to the requirements list. The service wants $14 million for cannon munitions to test and demonstrate cannon-delivered area effects munitions “as a bridging strategy to ensure compliant cluster munition area effect cannon artillery round,” the document states. The Army also wants $30 million to buy 20,000 2.75-inch Hydra rockets “to increase lethality through the procurement of High Explosive and Flechette rockets. 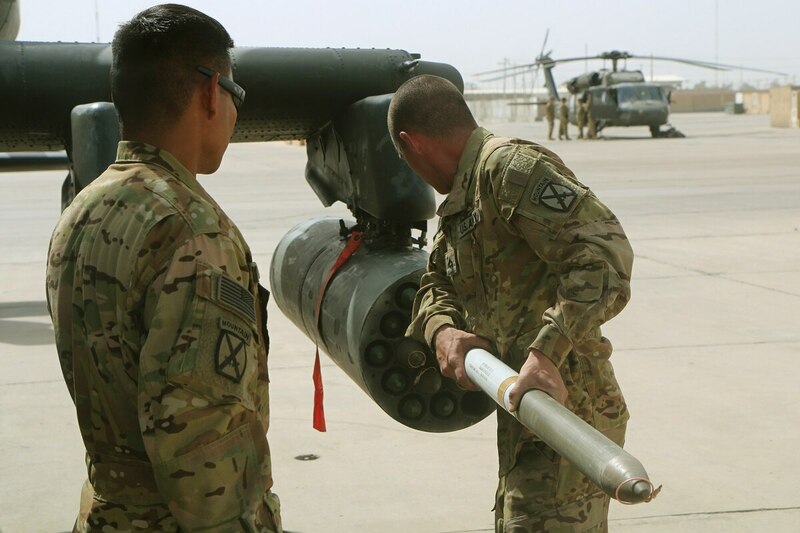 The Army’s regular FY19 budget request saw a major boost in munitions procurement. Last year, Army officials sounded the alarm that years of budget cuts had led to a growing shortage of munition production to restore what the Army had expended in various contingencies.